A hot water recirculator (circulator pump) is a device that circulates hot water through a house’s pipes so that hot water is always instantly available. In traditional one-way plumbing systems, water is run through a hot water heater and directed through the pipes towards the taps whenever a tap is turned on. When a tap is off, the water remaining in the pipes begins to cool and becomes stagnant. This is why users often have to wait a few seconds for the water to get hot. In a plumbing system that has a hot water recirculator installed, however, water is constantly circulated and re-heated so that the water is hot whenever the user needs it. 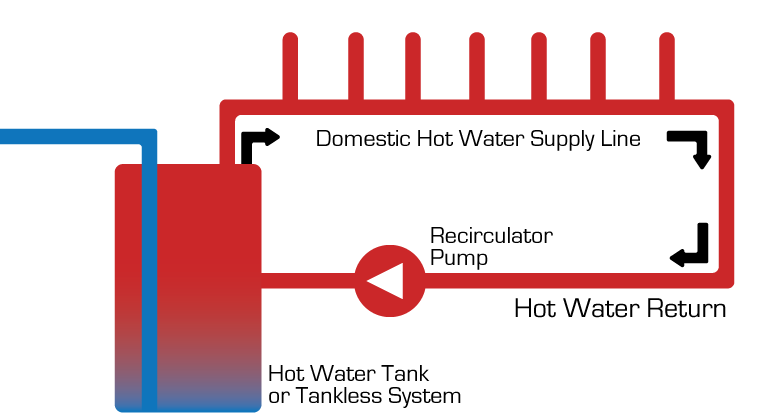 Typically, a hot water recirculator is placed near the hot water heater and continuously pumps and circulates water. Because fluid in a closed-loop pipe always returns to its starting point, a hot water recirculator only needs to pump the water hard enough to overcome the friction of the water against the pipes. Hot water recirculators are usually self-contained and fit all of its parts inside a water-tight casing. They have a small motor that powers a device known as an impeller. The impeller is a wheel with angled blades that shapes the water into a jet stream as the impeller rotates and water passes through it. Are you waiting and waiting and waiting for hot water? Have 3D Green Solutions Inc install a recirculation pump today! You will have endless hot water and if you use hot water infrequently you can set the built in timer to work when you need hot water the most! Give the plumbing experts at 3D Green Solutions Inc a call to have a recirculator pump installed on your plumbing system!